Helen Allan has secured a Visiting Scholarship to the Centre for Reproduction Research at De Montfort University from January to March 2019. Helen will be working on papers with Professor Nicky Hudson and her team which arise from the Early Parenthood after IVF study. Helen’s collaborators on this study have been Professor Olga van den Akker (MU), Professor Lorraine Culley (DMU), Dr Ginny Mounce (University of Oxford), Jo Killingley, Lindsay Ahmed and Therese Bourne (MU) and Ruth Hudson (Surrey & Borders NHS Trust). Research by Professors Sue Dyson and Olga van den Akker, Dr Liang Liu and Mike O’Driscoll uniquely draws together three important concepts for the first time: namely student volunteering, critical thinking skills for nurses, and caring and compassionate nursing practice and shows how these relate to critical pedagogy in the nurse education. The programme of research has so far resulted in three conference papers, one peer-reviewed publication, a book and international collaboration with Dr Kwadwo Korsah at the University of Ghana School of Nursing in Accra and the establishment of academic networks in Canada, Australia, and Latvia. Conference papers Mike O’Driscoll, a researcher in CCRNM, presented findings of research into the role that volunteering can play in developing critical pedagogy within nurse education at the AITNER Sociology conference in Athens in May and at the National Council of Voluntary Organisations Research Conference in Nottingham, in September. Also in September, Professor Sue Dyson presented findings from the research at the World Congress on Nursing & Nurse Education Conference in Rome. The presentations were very well received and led to many interesting discussions around volunteering in health professional education and how critical pedagogy relates to compassionate care. The presentation titled ‘The extent, variability and attitudes towards volunteering among nursing students: Implications for pedagogy in nurse education’ presented by Mike O’Driscoll at the AITNER conference in Athens can be downloaded here AITNER 2017 PRESENTATION. Peer-reviewed publication Findings from this research have also been published in the peer reviewed journal Nurse Education in Practice. Book The research is the subject of the book by Professor Sue Dyson to be published on October 7th. 2017: Critical Pedagogy in Nursing: Transformational Approaches to Nurse Education in a Globalized World (Palgrave Macmillan). The programme of research continues and for further information please contact Professor Sue Dyson (s.dyson@derby.ac.uk). Linda Collins our own Lecturer and PhD candidate was the speaker at our second seminar yesterday. Her research suggests that conventional ideas about testing urine for infections may need to change. She argued that what is often thought by testing labs to be ‘contamination’ of urine samples is in fact a sign of bladder infection, in the form of cells from the walls of an infected bladder. Here’s her abstract. A urinary tract infection (UTI) is a debilitating condition and is a leading reason for treatment in the primary healthcare sector. Women are more affected than men and it is estimated 50% of the UK female population would have experienced a UTI in their life time with subsequent recurrences. Diagnosis of a UTI is reliant upon a positive urine test result when a specimen is sent for microbiological testing. However, it is often reported that a urine specimen is contaminated with cells and sediments which leads to inconclusive results and ultimately a missed diagnosis. Urine specimen collection and microbiological testing is the crucial initial stage of the diagnostic process. An advanced cell staining technique (Uroplakin-3 staining) has proven that cells found in the urine are not contaminants, but are urothelial cells that have shed into the urine during the inflammatory stages of an infection, and reveal important pathology of a UTI. 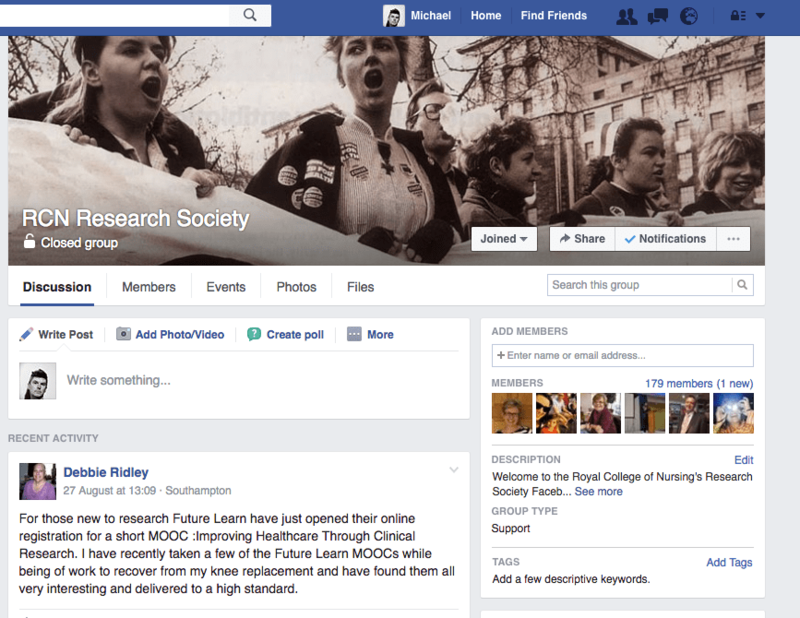 The RCN Research Society leaps fearlessly into the world of social media with a Facebook page. We have 179 members of the page so it is clearly a good way to reach a lot of researchers in nursing in one fell swoop. Maybe to advertise research jobs or publicise a recent paper or book or to informally canvas opinions of nurse researchers. Its to be found here. Day Essential CPD for Primary Care Event on Men’s Health. the needs of parents following IVF. Congratulations to Professor Helen Allan of the Centre for Critical Research in Nursing and Midwifery Education and colleagues who will investigate early parenthood experiences of infertile couples after successful fertility treatment as part of winning a development grant award. The research group, which includes Professor of Health Psychology Olga van den Akker and Professor of Nursing Helen Allan, won the Society for Reproductive and Infant Psychology (SRIP) grant award to run a workshop to develop a collaborative team for investigating the implications on IVF/ICSI conception and delivery of a baby for couples’ lives in early parenthood. Olga van den Akker and helen allan with colleagues at De Montfort (Lorraine Culley) and Dundee (Andrew Symon) and Flinders University in Austraila (Sheryl de Lacey) have won a Society for Reproductive and Infant Psychology developmental grant award to run a workshop to develop a collaborative team to investigate the implications of IVF/ICSI conception for couples’ lives in early parenthood. This topic is under-explored in the literature internationally. Existing research has identified potential health need but this is ignored by policy makers although acknowledged by service users in the UK. We plan to address this gap in research with our focus on transition to early parenthood for infertile couples, on fatherhood as well as motherhood and on our use of mixed methods as an interdisciplinary team which includes a strong service user perspective. We believe this work has relevance both nationally and internationally. We’ve just started putting our own website together that will complement the page on Middlesex University’s own site. With our own site we can post material more quickly than a large organisation is able to do. We will be putting up our briefings as we respond to current events that affect nursing and healthcare in the beleaguered UK NHS.